It is said that Jefferson actually signed the Declaration of Independence from the seat of a Windsor chair. 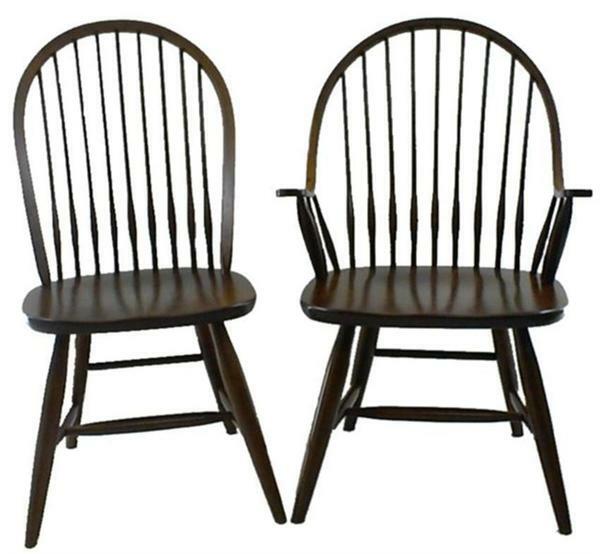 The Windsor chair style came from England and was then used primarily as an outdoor garden chair. It is thought that King George III made the Windsor Chair popular when he enjoyed the comfort of one that he sat in during an escape from a rain storm in a countryside cottage while on a fox hunt. The most popular color for Windsor chairs in the late 1700s was a green paint Windsor chair. Windsor Chairs were likely the first manufactured dining chair in the United States. Our Amish made Early American Windsor Dining Chair has an enduring quality about it that will appeal for years and years. It has the look of an antique Windsor chair but is actually custom made for each customer. Please call one of our Amish furniture specialists today to with questions on the Early American Windsor Chairs, to place an order for your dining chairs or to receive finish samples. If you are in Florida, please visit our Amish furniture store in Sarasota. We can't wait to meet you! Arm Chair Seat Width: 20 ¾"